Listen to Tom Andew talk about his time at Sponaugle Wellness. His speech was extremely powerful. undergone unsuccessful treatment by 20 or more physicians. 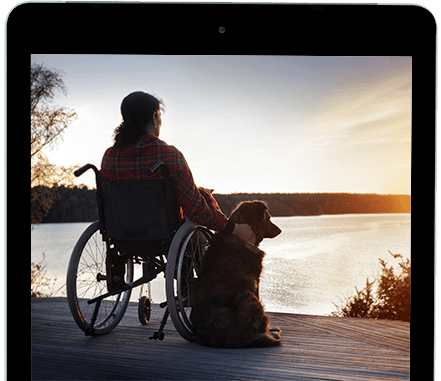 a precise diagnosis and individualized treatment plan. At Sponaugle Wellness Institute, we practice integrative medicine combining the best of western medicine and natural medicine to assist the healing of patients suffering from chronic illness. 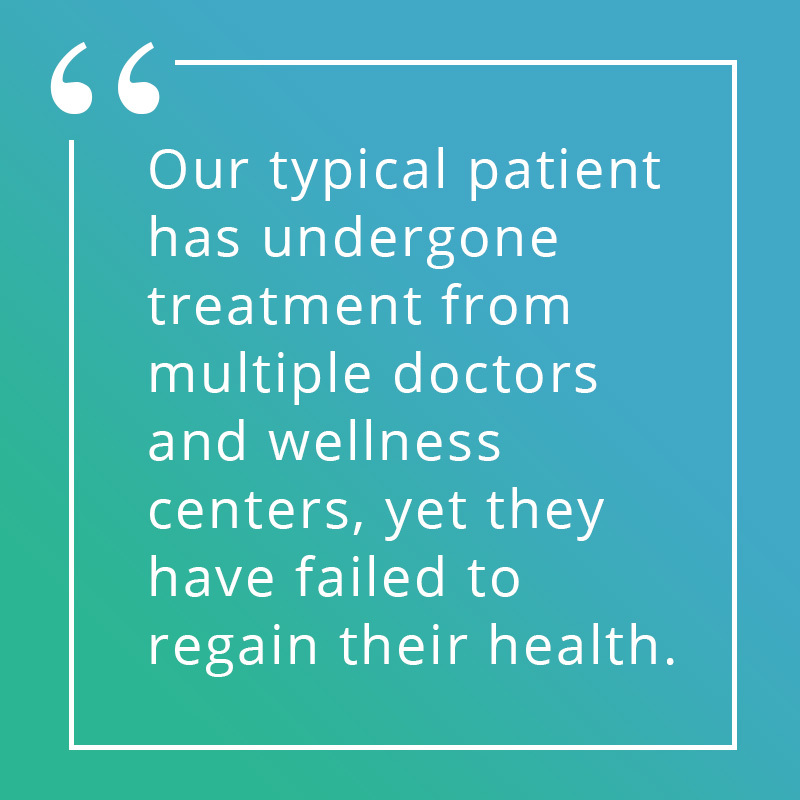 Our typical patient has undergone treatment from multiple doctors and wellness centers, yet they have failed to regain their health. These complicated patients normally suffer from multiple undiagnosed medical disorders. They require a more comprehensive diagnostic work up and a more intensive treatment than is available through routine “wellness” medicine. Sponaugle Wellness Institute is most well-known for lyme disease treatment, but there are a number of other chronic conditions that we also treat. Our Founder, Dr. Rick Sponaugle is the country’s leading lyme disease specialist, but his expertise in brain research has led him to develop an unparalleled detoxification program to help alleviate symptoms related to chronic lyme disease, mold toxicity, industrial toxicity, wellness and other chronic illnesses. Click the conditions below to learn more about our treatment options and research. Sponaugle Wellness integrates modern brain science with wellness medicine to balance and optimize brain function; this stops craving for drugs & alcohol. Biofilm is a protective shield manufactured by invading organisms to escape attack from our antibodies and natural killer cells (immune system). Antibiotics that were intended for medical treatment, have unwisely been used for agricultural purposes – poultry, dairy, and stockyard beef production. American industry has manufactured over 84,000 toxic chemicals since 1930, none of these toxic chemicals were God’s idea, and they are killing us. At Sponaugle Wellness Institute, we have successfully treated Chronic Lyme Disease patients from around the world. Mold toxins are toxic gases produced by many indoor molds. Mold toxicity is an emerging illness that has become much more prevalent in the last 50 years. Rick Sponaugle, MD is an integrative physician who attempts a more precise diagnosis through quality forensic medicine. He performs an analysis and correlation of approximately 400 numerical biomarkers. This extensive evaluation enables Dr. Sponaugle to diagnose the underlying cause of his patient’s illness. With emphasis on environmental medicine and tick-borne infections, Dr. Sponaugle specializes in treating brain and neurological disorders that are derived from severe neurotoxicity. The majority of our patients require simultaneous treatment for multiple medical disorders including: Mold Toxicity, Industrial Toxicity, Gut Toxicity, Lyme Disease and several additional tick and mosquito-borne infections. These “stealth” infections commonly attack the brain and neurological system. Patients with chronic Lyme disease commonly suffer with brain and neurological issues, in addition to multiple organ dysfunction, much like hospitalized critical care patients. Dr. Sponaugle uses the experience he acquired from working in critical care medicine for 20 years and the expertise – derived from treating thousands of patients with brain and neurological disorders – to treat Lyme disease patients. We succeeds where others have failed. At Sponaugle Wellness Institute, patients who have been bedridden or in wheelchairs for years have hope that they will be able to walk again. Toxin-induced suppression of killer cells and antibodies is preventing patients from killing tick-borne and mosquito-borne infections such as Lyme disease, Bartonella, Bebesia and Protomyxoa Rheumatica. Subsequently, the lipophilic bio-toxins produced by these bacterial and parasitic infections further increases the toxic load in patients who are already suffering from environmental toxins. American industry has manufactured over 84,000 toxic chemicals since 1930. None of these toxic chemicals were God’s idea and they are destroying our brain and body. A majority of these industrial toxins are not only carcinogens, they are also neurotoxins and immunosuppressant in nature. Most of these industrial toxins are derived from petroleum products. They are lipophilic; fatty in molecular structure. Problematic, the cell membranes of every cell in our body consist of a phospholipid lipophilic structure. In fact, 50 percent of the cell membrane is comprised of phosphatidylcholine. These lipophilic toxins can deposit in and destroy the cell membranes of various organs after which they begin to accumulate in our fattiest tissue, our brain, and neurological system; thus the term neurotoxicity. What are mold toxins? Mold toxins are toxic gases produced by many indoor molds. Mold toxicity is an emerging illness that has become much more prevalent in the last 50 years. What has changed? After the Arab oil embargo in 1973, we began building air-tight, energy-efficient homes and buildings. These air-tight, water-damaged buildings do not “breathe,” and therefore our indoor air becomes saturated with mold toxins. Another change we made in the 1970s was the transition from plaster to drywall. This change in the use of building materials caused a spike in mold toxicity because molds flourish on wet drywall. Overall, the advent of drywall and the production of energy-efficient homes in the 1970s caused a rapid rise in the number of Americans experiencing mold symptoms and suffering from mold illness. At Sponaugle Wellness Institute, we have successfully treated thousands of patients who were suffering from undiagnosed mold toxicity because of their exposure to mold spores and toxic molds in water-damaged buildings. We have correlated 6,015 mold-mycotoxin levels with toxin-induced aberrations in our patient’s brain chemistry patterns and with abnormalities seen on their brain scans. The abnormalities seen on the brain scans of our mold-toxic patients correlate well with their neurological symptoms*. Since the advent of penicillin during World War II, we have poisoned our food supply with antibiotics. Antibiotics that were intended for medical purpose, have unwisely been used for agricultural purposes – poultry, dairy, and stockyard beef production. Because of antibiotic-laden foods, most Americans are suffering from gastrointestinal dysbiosis. A dysfunctional intestinal tract can distort the delicate balance of brain biochemicals called neurotransmitters. Homeostasis, or balance of the immune system, the hormonal system, and the nervous system is critically dependent on a healthy intestine. This is called the gut-brain connection. American Industry Has Given Us More Than 84,000 Synthetic Chemicals Since 1930!